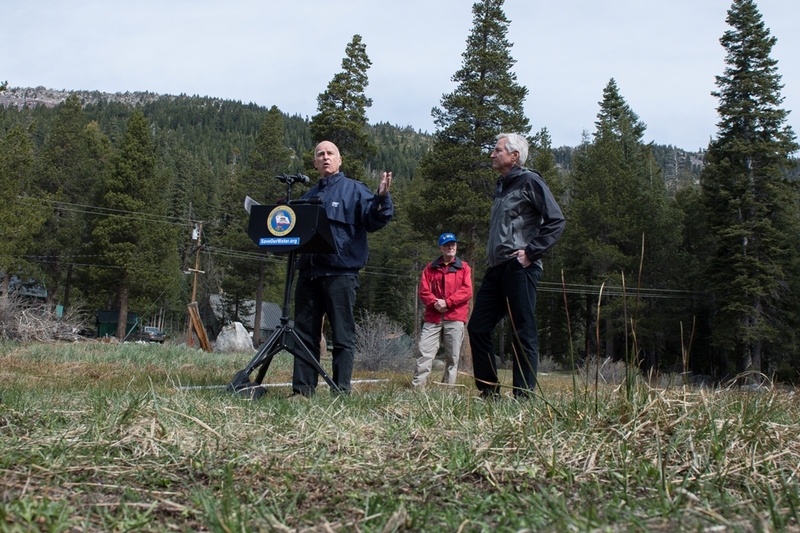 California Governor Jerry Brown announces the state’s first ever mandatory water restrictions. The state’s snowpack, in the fourth year of a deep drought, is the lowest on record. Click image to enlarge. Taking his strongest measures yet in response to California’s drought emergency, Governor Jerry Brown ordered on Wednesday a statewide 25 percent cut in urban water use. The wide-ranging executive order, announced while the Democratic leader stood on bare ground in the Sierra Nevada mountains, includes 31 provisions for cutting water use, monitoring and managing supplies, speeding the review of new water projects, and extending state aid to families in homes without running water. At the end of winter, the state has almost no snow to replenish its reservoirs. Measurements made on April 1 showed snow levels at just 5 percent of normal, smashing the previous standard of 25 percent set in 1977 and 2014. The governor’s action reflects a renewed urgency regarding water supplies. With the wet season ending and six months of summer heat to come, the nation’s most populous state is beginning to recognize that it must change course in order to avoid running short of water. Even with conservation success, California’s fourth consecutive dry year will become more desperate week by week, particularly in the Central Valley, where farmers are on edge, farm workers are unemployed, and rural residents live with the fear that their water well, like their neighbors’, may go dry. Abysmal winter snow levels are emblematic of the uncharted territory that the entire state is traversing. “We’re not only setting a new low, we’re completely obliterating the old record,” said David Rizzardo, chief of snow surveys at the California Department of Water Resources, during a conference call hosted today by Circle of Blue. The governor’s executive order is broad, requiring seven state agencies to implement its provisions. Though the order addresses forest fire prevention, water quality in the Sacramento-San Joaquin Delta, and dozens of other items, most of the actions center on reducing water use. The governor asked state residents more than a year ago, in January 2014, voluntarily to cut demand by 20 percent, but the response was lackluster. Only once since June, when data was first released, did residents achieve in a single month a 20 percent reduction. California officials will come at the problem from many angles, an “all hands on deck approach,” according to Ghilarducci. The California Energy Commission will administer a rebate program to replace water-inefficient appliances. The amount of money available for the program was not immediately known. The Department of Water Resources will lead an initiative with local partners to replace 50 million square feet of grass with native plants and other drought-tolerant landscaping. The Department of Water Resources will immediately begin planning for the construction of temporary rock dams in the Sacramento-San Joaquin Delta. These dams are used to push salt water out of the state’s most important water body, but they also have the potential to cut off fish migration routes. The state’s most important groundwater basins must all measure and report groundwater levels, as was set out in a 2009 state law. Before, compliance was mandatory only if the basins wanted to apply for certain state grants. The Department of Water Resources will require drought management plans for farm districts and expand these requirements to any district supplying more than 10,000 farm acres. The water board will strengthen water-use reporting requirements to help enforce the water rights system. The Office of Emergency Services will provide assistance to families forced to move from their home because of a dry well. The State Water Resources Control Board will oversee the restrictions. The board must develop regulations to achieve a 25 percent statewide reduction in urban use compared to 2013. Not every city will be treated the same, according to Felicia Marcus, the board chair. Cities that are already conserving will be asked to do less, while cities where water use is relatively high per person must do much more. “A number of agencies will have to step up mightily,” Marcus said, meaning some areas will be required to go beyond a 25 percent reduction. According to water board data, residents of 300 out of 384 water agencies used more than 100 gallons per person per day, most of them in the arid Central Valley and inland Southern California. The state standard for meeting human health and safety needs is 55 gallons per person per day. Each water supplier will be given a unique target, Marcus explained. The board has not determined how to set the targets, she added, but a proposal will be published by mid-April with regulations adopted in May. Cities that do not meet their goals face a $US 10,000 per day fine, Marcus said. Cities are also required to ban the use of drinking water to irrigate street medians, and to develop water rate structures that encourage conservation by making water more expensive. Though the governor’s order does not ask for the agriculture sector to cut water use, state officials stressed that reductions in water supplies from state and federal irrigation projects announced earlier this winter were a harsh restriction on farmers. Farms in the Central Valley will get no water from federal canals and only 20 percent of a full supply from state canals. The restrictions on urban use drew praise from researchers and science organizations, which claimed that these measures are necessary for the state to adapt to a warmer climate in which droughts are more frequent and more severe. Technology will be a part of the solution. Lawn irrigation is tremendously wasteful BECAUSE irrigation systems are hydraulic and typically 40-50% efficient. It is the biggest use of household water in the US; per the EPA “as much as 50% … is wasted from inefficient watering methods and systems”. This inefficiency costs us 4-5 billion gallons daily. Emerging technology digital sprinklers (e.g. IrriGreen, Droplet) will save that water, trillions of gallons (far more than low flow showers toilets and faucets, combined) With far more efficient digital sprinklers, people need far less water to have, as Gov. Brown says, “a nice little green lawn” for their kids to play on. There is a solution, it is long term and solves many problems simultaneously. The NINA Access Pathway is an adaptation of the urban landscape that allows for efficient urban rain water harvesting, isolation of contaminated road water, efficient local storage, low cost redistribution of potable water to households, efficient solar energy networks, safer greener streets, dense optical fibre fabric networks, increased economic productivity, increased economic productivity and it is not reliant on increased public debt. It will take 20 years to build out California, but as each block is completed benefits begin to accumulate. On completion California will climate resilient and a have negative carbon footprint i.e. it will be removing CO2 from the atmosphere and be one of the worlds most vibrant and sustainable economies and habitats. This is the solution.